Employers across the United States faced a deadline on Wednesday, May 8, 2013, that some may not know exists but that could prove costly if ignored. The form appears to be short and simple, requesting an employee’s name, address, Social Security number and citizenship status. But immigration and business experts say it’s more complex than it looks. Employers with even a single worker have been required to keep the forms on file for all employees since 1986. But government audits tended to be rare. That has changed under the Obama administration, which has investigated companies more aggressively, Shusterman said. Government audits of employer I-9 forms rose from 250 in fiscal 2007 to more than 3,000 last year, according to data from U.S. Immigration and Customs Enforcement cited by the Associated Press in December. 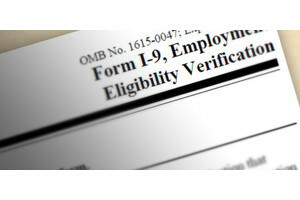 Last March, Congress approved updates to the form, which new workers are required to fill out to verify identity and employment status. Both versions of the form have been accepted during a two-month grace period. But starting Wednesday, the updated, two-page form, will be the only valid one. Johns Hopkins Bayview Medical Center is one local employer that already has switched to the new form. Michele Sedney, director of employment services, said the hospital has been using it for about a month. She noted that other than some additional data fields, the new form isn’t significantly different, though she says it now penalizes employers if they fail to use the proper format for entering an employee’s birthdate. Bayview’s employment department, which is responsible for more than 3,000 workers, has staff members assigned specifically to keep up with the requirements and review the forms, Sedney said. Other large employers outsource the handling of the forms. Safeway uses a division of a payroll services vendor, which checks the information and stores the forms electronically, said Gregory A. Ten Eyck, spokesman for the grocer’s Eastern Division. Smaller organizations that don’t have large human resources departments might find it harder to keep up with new requirements, said Shusterman, who lectures employer groups on I-9 compliance. But mistakes are common at companies of all sizes, he said. At one company that hired him to do an audit, he found mistakes in nearly every one of the more than 100 I-9 forms reviewed. Mistakes can include missing or contradictory information or incorrect citizenship status. The form’s language also leads to confusion, he said. A noncitizen U.S. national, for instance, means someone born in American Samoa or “certain children of noncitizen nationals born abroad.” But Shusterman said he’s found few people familiar with the term. Employers also can inadvertently trip up in a section to review and verify documents used to prove eligibility, he said. Employers could be fined if a worker uses a falsified document, even if the employer believed the document to be valid. If employers overcompensate and request too many documents or try to steer employees to choose certain types of documents, they could leave themselves open to discrimination lawsuits, he said. “Employers get so worried about fines that they discriminate and treat people who are foreignborn different than a person without an accent,” he said. Groups such as the National Federation of Independent Businesses have been trying to get the word out to encourage small businesses to be in compliance.